In late December and into January we saw multiple (OIE confirmed) reports of HPAI H5N1 in poultry and in Crows in Bihar and Orrissa, along with the deaths of numerous captive birds (including peacocks) at the Sanjay Ghandi Biological Park in Patna, Bihar. India, which was plagued by numerous outbreaks of HPAI H5N1 a decade ago, has only announced sporadic H5N1 activity in recent years, often reported in wild crows. In the fall of 2016 - just prior to its arrival in Europe - HPAI H5N8 was widely reported across India as well. Despite heavy H5N1 activity across the India-Pakistan-Bangladesh region in the past, Bangladesh has only reported 8 human infections (1 death), Pakistan has reported 3 human infections (and 1 death), and India has reported no cases. Whether this lack of reported human infections in India is the result of a less virulent strain circulating in the region (see Differences In Virulence Between Closely Related H5N1 Strains), or is due to less rigorous testing and reporting - or something else entirely - is unknown. But avian flu viruses are constantly evolving, and so past performance can't guarantee future results. 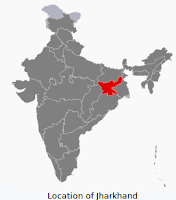 Overnight the India English and Hindi press has lit up once again with reports of avian flu (subtype not specified, but likely H5N1) in poultry and dead crows, in and around Ranchi, Jharkhand. A hat tip goes to Pathfinder on FluTrackers (see thread) for several of these media accounts. There are also (unconfirmed) reports of three patients hospitalized with severe pneumonia (see below), who are being tested for the virus. 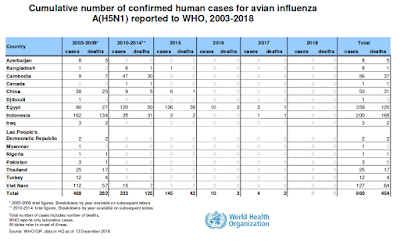 While avian flu infection is always a possibility, it is worth noting this is regular flu season in India, and they've reported hundreds of severe cases (and deaths) from seasonal H1N1. As the Indian press tends to wax hyperbolic about avian (or swine) influenza, a healthy dose of Caveat Emptor is always advised. A Google search in Hindi for bird Flu (बर्ड फ्लू का) returns these top stories for the past 24 hours. An alert has been issued in the province on behalf of the Health Department regarding bird flu and swine flu. Health Secretary Dr Nitin Madan Kulkarni said that we have alerted all the civil surgeons including three medical colleges. The Animal Husbandry Department has also requested that it notify it promptly so that necessary action can be taken. The Secretary said that the Health Department is fully prepared in its work. Even in the Department of Medicine of Rims, Dr B Kumar's unit has admitted the patient of Swine Flu, Rajendra Mahto (name changed). Dr. Kumar told that this patient has kidney failure (CKD). It was examined from outside, which found swine flu positive last week. Again, his sample has been sent to the microbiology department of Rims, to ascertain whether the swine flu has been cured or not. On behalf of RIMS's microbiology department, three possible patients of bird flu have been sent blood samplus and NICD has been sent to Kolkata. The investigation report is expected to come by Monday. Only after the investigation will the infection be confirmed It will also be able to know that the infection detected in the patient is from swine flu (H1N1) or bird flu (H5N1). Dr. Manoj Kumar, HOD Professor of RIMS's Microbiology Department said that only after getting the report can we say something in this matter. The symptoms of both diseases are almost the same. Supposedly we'll get the results of these tests sometime tomorrow. We should also get more details on the wild bird and poultry infections from the OIE or the FAO in the next couple of days as well.